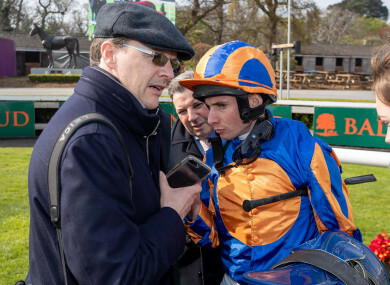 Aidan O'Brien speaks with jockey Ryan Moore. THE 2019 FLAT season stepped up a notch at Naas on Saturday, when Imaging won the Group 3 Gladness Stakes and Magical won the Group 3 Alleged Stakes. Magical was very good. Aidan O’Brien’s filly travelled well for Ryan Moore through the early stages of the race, behind a decent pace that was set by Success Days and her stable companion Flag Of Honour. Still on the bridle as they passed the two-furlong marker, Moore took her towards the near side and allowed her ease up on the outside of the leaders as they raced towards the furlong pole. It wasn’t until they were inside the final furlong that the rider asked his filly to pick up and, when he did, the response was impressive. The Galileo filly strode powerfully clear, putting four and a half lengths between herself and her closest pursuer by the time she reached the winning line. It was a nice step into the season by a top classy filly. Magical has had plenty of racing, and she has thrived. She raced seven times as a juvenile and she raced seven more times last year as a three-year-old. As a two-year-old, she won the Group 2 Debutante Stakes, and she was beaten a short head by her stable companion Happily in the Group 1 Moyglare Stud Stakes. As a three-year-old, she won the Group 1 Fillies & Mares Stakes on Champions’ Day at Ascot, and she almost beat Enable in the Breeders’ Cup Turf. That was some tussle. Enable v Magical, two top class European fillies going toe to toe down the stretch at Churchill Downs, propelling each other forward and carrying each other nine lengths clear of their rivals. Enable is obviously an outstanding filly, a King George winner, an Epsom Oaks winner, an Irish Oaks winner, a dual Arc de Triomphe winner, and Magical ran her to three parts of a length in a career-best performance. Saturday’s performance was very good too. The form is rock solid, with four and half lengths back to Irish St Leger winner Flag Of Honour in second, and four and a half more lengths back to Irish Derby winner Latrobe in third, with another half a length back to Still Standing, a race-fit and progressive listed race winner who was receiving weight from his rivals. It will be interesting to see where Magical goes now. Aidan O’Brien said afterwards that she could go for the Prix Ganay or for the Mooresbridge Stakes before going for the Tattersalls Gold Cup at The Curragh on Irish Guineas weekend. She obviously stays a mile and a half, but she has the pace for 10 furlongs. She could have an exciting season ahead. The second and third could also have exciting seasons ahead. Flag Of Honour did well to keep on as well as he did to take second place, over a distance that was well short of his best. Last year’s Irish St Leger winner, he also holds an entry in the Mooresbridge Stakes over 10 furlongs, but he probably won’t be seen to best effect until he steps up in trip again this season. He holds an entry in the Yorkshire Cup at York’s Dante meeting in mid-May, and he will be of interest if he lines up there. Latrobe also put up a good performance in finishing third. Joseph O’Brien’s colt was seventh of the eight runners passing the furlong pole and, while it never looked like he was going to get close to the winner, he did stay on well to take third place. Winner of the Irish Derby last year and second to Flag Of Honour in the Irish St Leger, he is another who should do better when he steps back up in trip this season. Dermot Weld continued the fine start that he has made to the season when he sent out Imaging to win the Group 3 Gladness Stakes. The Oasis Dream colt had race-fitness on his side, he had won the Listed Heritage Stakes at Leopardstown 10 days earlier, but he showed a fine turn of foot here and he stayed on well to hit the front deep inside the final furlong. It was a fine ride too by Oisin Orr, who delivered his horse with a really well-timed run to record the first Group race win of his burgeoning career. There were a few things to note from the race, besides the quality of the performance that the winner put up. The runner-up, for starters, No Needs Never, did very well to finish second, a three-year-old taking on his elders at this very early stage of the season. True, the No Nay Never colt was receiving a significant weight allowance, he was getting a stone and more from the older colts and geldings, but not many three-year-olds run in the Gladness Stakes, and the last three-year-old to win it was Softly Tread for Con Collins and Pat Shanahan in 2001. Romanised ran better than his finishing position in fifth place suggests. Ken Condon’s colt, last year’s Irish 2000 Guineas winner, didn’t have a lot of racing room on the run to the furlong pole, but he kept on well among horses to finish a close-up fifth. He was beaten less than two lengths in total, and he is deserving of another chance. Le Brivido ran a race that was full of encouragement too. Ryan Moore got the son of Siyouni nicely settled at the rear of the field, and he stayed on strongly inside the final furlong to take third place, just over a length behind the winner. Trained by Andre Fabre at the time, Le Brivido was an impressive winner of Jersey Stakes at Royal Ascot in 2017, when he raced out in the centre of the track. He didn’t run afterwards that season, and he raced just once last year, he could finish only sixth in the Abernant Stakes at Newmarket, when he raced more freely than ideal. He was making his debut for Aidan O’Brien on Saturday, it was his first run in almost a year and it was just the sixth run of his life, and it was a more than satisfactory comeback run. He is obviously a highly talented individual and, as long as he continues to settle as well as this through his races, there is every chance that he will get a mile all right. He is obviously very good over this seven-furlong trip, but he is bred to get further. He holds an entry in the Group 1 Lockinge Stakes at Newbury in mid-May, and that is a legitimate target. Email “Magical's mystery tour: it'll be interesting to see where Aidan O'Brien's star goes now”. Feedback on “Magical's mystery tour: it'll be interesting to see where Aidan O'Brien's star goes now”.